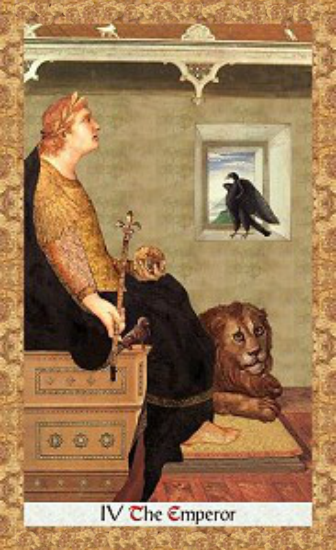 Today you may find yourself having to assume a position of power in order to “take care of business.” The Emperor card is all about attending to material concerns, which may mean having to set aside feelings of fear or uncertainty and stepping into a more confident and authoritative role. The Emperor card is the archetypal “Father.” It embodies the masculine principles of motivation, stability, discipline, structure and rules or laws. As with many of the Major Arcana figures, the Emperor can appear in your life as a person (a father, boss, judge, or government official, etc. ); he can represent a frame of mind that you need to assume; or he can appear as an event — such as a promotion or recognition in the community. As the Emperor also relates to the Laws of the Land, some of the less pleasant manifestations of this card include being on the receiving end of legal or professional disciplinary actions, dealings with the IRS or government, or having to deal with an oppressive boss or co-worker. In this version of the card, we meet the Emperor Julius Caesar seated at his throne. A Lion rests at his feet and an Eagle is perched on the windowsill beside him. He holds a small globe in one hand and a sceptre topped by a fleur de lis in his other. The Lion and Eagle are perfect symbols for today’s Sun trine Pluto aspect. This aspect actually bodes well for working with others. Trines generally make for very harmonious and cooperative interactions — whether you’re the one meting out responsibilities or are on the receiving end of someone else’s authority. The Eagle is a common feature of the various Emperor cards, representing mastery and power. It is also the highest vibration of the Scorpio archetype, above the snake (lowest) and scorpion (middle). Pluto is the modern ruler of Scorpio. The Lion, which rules Leo, represents bravery and courage. Leo is the natural ruler of the Sun. The fleur de lis is said to represent a flower (typically a lily) but may also have a hidden meaning — that of a lance. Imagine a weapon that is part lily and part spear. How very Plutonian. You can accomplish a great deal today, if you focus on working with others rather than seeing yourself as either above or below them. Cooperation is the key. The card used for today’s Tarot Scope is part of the Golden Tarot series by Kat Black, distributed by U.S. Games, Inc. Kat offers a variety of purchasing options at her website’s Shop. 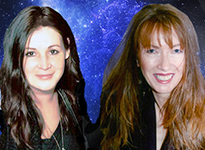 For more information on Kat or the Golden Tarot in general, check out the many links on her website and be sure to “like” Kat Black’s Facebook Fan page.